The sight of Brazilian footballers gracing the Nou Camp in the blue and red jersey of Barcelona is one that has become as familiar as the sky on a clear Monday morning. Such is the connection between this great club and this great nation of players that Philippe Coutinho’s £142m move this month makes him the 33rd Brazilian (or 30th if you are looking at Brazilian signings who have never played for the club even though they are signed to its books) to play for the club. Along the way, the Cules have been enchanted by the mesmerizing skills, contributions and goals of players like Romario, Ronaldo, Ronaldinho, Rivaldo and Neymar. These players have wowed the Catalan crowd (and the footballing world) making waves as well as winning trophies & individual awards. There have also been the hardworking silent Brazilian types who have also contributed, though their positions on the pitch or style of play have not earned them the adulation of the aforementioned ones. In this category, you have players like Edmilson, Maxwell, Thiago Motta and others. Then there are the ones who have either been mediocre or complete failures. These are the players who have stood out for their non-performance and have blotted the copybook of Brazilians in Catalonia. Rightly revered in France for his exploits with Olympique Marseille, Olympique Lyonnais and AS Monaco, Sonny, as he was popularly called, was a mediocre player at Barcelona. 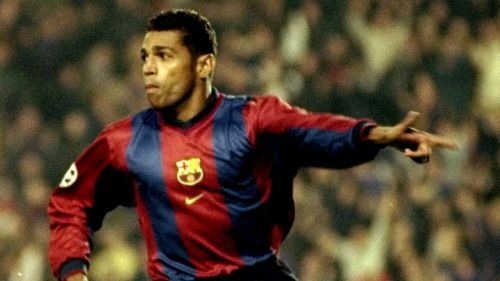 He arrived at the Nou Camp on the back of 4 very good seasons where he had scored 67 goals in 111 games for Marseille and AS Monaco (he won Ligue 1 or the French Championnat as it called then with Monaco in 1997). From the get-go, Sonny struggled to get into the Barcelona team as Luis Enrique and Patrick Kluivert were ahead of him in the pecking order and the manager at that point, Louis Van Gaal was unwilling to tweak his line up to fit in the explosive Brazilian. Sonny had a reasonably good first season at Barcelona scoring 10 goals in a season where the Blaugrana did the double (La Liga and Copa Del Rey). The next season was chaotic for the Brazilian as his frustration at being constantly on the bench spilt into arguments with a very stubborn Louis van Gaal, which led to Sonny’s eventual sale to Lyon.